I was really skeptical of when I first heard about this project, a biopic of Brian Wilson in which he’s portrayed by Paul Dano when he’s young and all mixed up in the ‘60s, and John Cusack when he’s middle-aged and all mixed-up in the late ‘80s and early ‘90s. The stills and footage that were initially released showed that there was a lot of attention paid to Dano’s look via his hair and wardrobe made to make him look like prime period Wilson, but the pics of Cusack, well, they just looked like Cusack. No attempt to make him look like Wilson in his 40s with a salt-and-pepper pompadour or anything. It’s just Cusack with his jet black hair, wearing shirts he’d normally wear like he just walked on to the set and refused to take part in any hair and make-up nonsense. It’s a lot like how Cusack appeared as Richard Nixon in Lee Daniels’ THE BUTLER a few years back. Despite a little bit of a prosthetic to elongate his nose, Cusack still just looked, and mostly acted (he made a slight attempt at the disgraced President’s accent) like himself. It’s odd as Cusack has had a rocky career of late, walking through a bunch of sad direct to VOD releases, and not even appearing in HOT TUB TIME MACHINE 2, the sequel to the last movie he made that could reasonably be called a hit, so you’d think he’d change his look a little here to play the iconic singer/songwriter/producer. But maybe the point in producer turned first time director Pohlad’s adaptation of the life of Wilson is that he shouldn’t have to. It’s like Todd Haynes’ I’M NOT THERE, the abstract 2007 biopic of Bob Dylan in which 7 different actors played Dylan at various points of his career. The themes, thoughts, and tones from the times that enhance the non-stop music are the focus, not whether whoever looks like the actual person. The movie, which was co-scripted by Oren Moverman, who co-wrote I’M NOT THERE not coincidentally, moves back and forth from Dano’s Wilson in full genius mode to Cusack’s burned-out Wilson who’s under the control of corrupt psychotherapist Dr. Eugene Landy (Paul Giamatti chewing the scenery to bits). Both versions of Brian (or “Bri” as his fellow brothers and bandmates call him) have their villains. Dano has his father Murray Wilson (Bill Camp) and Mike Love (Jake Abel) on his back about making more conventional, commercial music (in protest Brian exclaims: “We’re not surfers - we never have been - and real surfers don't dig our music!”) while Cusack has the evil, oppressive Landy thwarting his every move to have a normal life. And a normal love life via Elizabeth Banks in a warm, winning performance as Melinda Ledbetter, former model turned Cadillac saleswoman (they have a meet cute at her dealership), who sees pretty quickly that Giamatti’s Landy is a horrible influence on the beleaguered Beach Boy. Melinda witnesses the creepy doctor’s methods – made creepier by Giamatti’s bug-eyed intensity - under his oppressive 24-hour a day supervision. Landy, who we see in a pivotal scene berating his patient for eating a hamburger without permission, eventually forbids the budding relationship between Melinda and Brian. Melinda then starts phoning members of Wilson’s family, and doing what she can to rescue Brian from Landy’s clutches. This is well-acted, well executed stuff, but the real heart of the film is in the recreations of the studio sessions in the ‘60s. It’s apparent that filmmaker Pohlad, and screenwriters Moverman and Michael A. Lerner, have studied every bit of footage, noted every instance of studio chatter, and absorbed every bit of the multi-disc box sets, and bootlegs of “Pet Sounds” and Smile” material. They also earn points for depicting and paying respect to “The Wrecking Crew,” the group of top notch session musicians that took endless notes from Brian on how to arrange his “teenage symphony to God,” but not calling them by that name as it was applied much later. Dano and Cusack both do good work in embodying the tortured artist that has heard voices in his head in 1963, but it’s Dano who nails the young Brian’s angsty ambition. And, like I said before, it helps that he actually resembles Wilson. While Cusack puts in one of his most lived-in performance in ages, I still had to remind myself that he was playing the same person as Dano. 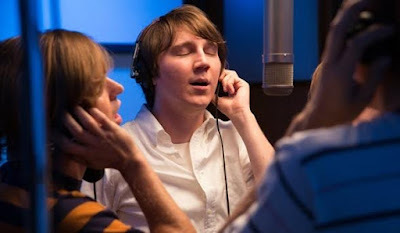 LOVE & MERCY is a much better than average musical biopic, because it’s more concerned with capturing the psychological essence of its subject than it is with a formulaic greatest hits approach – although its soundtrack is prime period Beach Boys tracks blaring from start to finish. The casting may be a bit mismatched, but the vibrations it picks up, both good and bad, all resonate extremely deeply.